Desperate Tories in Chorley have put out a leaflet trying to scare people off voting for UKIP by claiming that a vote for UKIP is a vote for Labour. The leaflet makes no mention of policy at all and the only "positive" message is that their MP voted for a referendum on "Europe" a few months ago, referring to the vote on a referendum on membership of the EU (geography isn't negotiable) in which their leader whipped his MPs to vote against holding a referendum. According to the leaflet "UKIP can't win here" which is probably what the Tory, Labour and Lib Dem candidates in East Sussex thought, right up until the results of the Seaford Town Council by-election were announced on Thursday night. 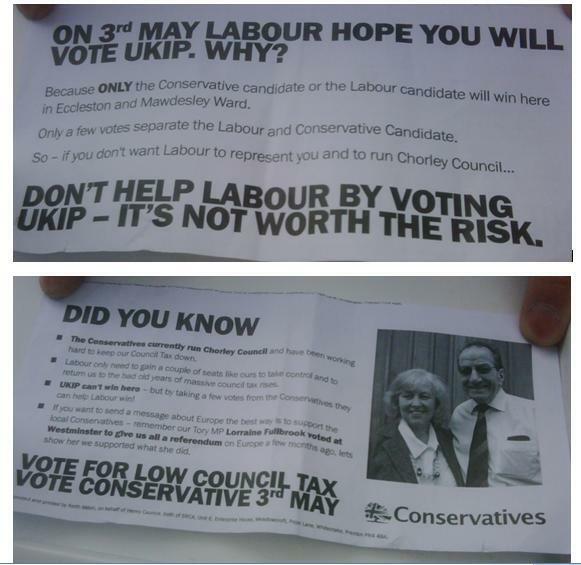 Remember, if you vote Conservative in Chorley, there is a very real risk you will end up with another Conservative or Labour council. UKIP candidates for Chorley and the rest of the north west of England are listed on the UKIP website.